Ninkare Frafra Dictionary - La ãn sõŋa. Search for a word in the Ninkare dictionary. 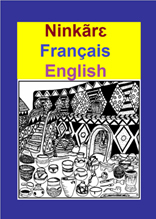 You can search for the Ninkare, the English or French word (or part of a word). To enter characters in Ninkare or French you may click on one of the buttons above the search box.